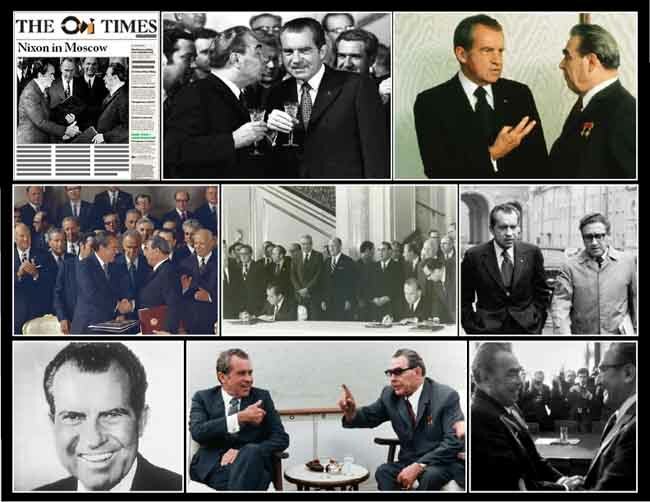 May 22nd 1972; on this day, President Richard Nixon arrives in Moscow for a summit with Soviet leaders. Nixon's second visit to Moscow in May 1972, this time as president, was for a more conciliatory purpose. During a week of summit meetings with Soviet leader Leonid Brezhnev and other Soviet officials, the United States and the USSR reached a number of agreements, including one that laid the groundwork for a joint space flight in 1975. On May 26, Nixon and Brezhnev signed the Strategic Arms Limitation Treaty (SALT), the most significant of the agreements reached during the summit. The treaty limited the United States and the USSR to 200 antiballistic missiles each, which were to be divided between two defensive systems. President Nixon returned to the United States on May 30.